A utility knife, this quality tool can be used to complete a variety of cutting and slicing tasks in your commercial kitchen. Offering a serrated edge, it is the perfect tool for slicing breads but is also suitable for carving meats and chopping vegetables. Equipped with an easy-handle, you will get a strong grip thus minimizing the risk of accidents. 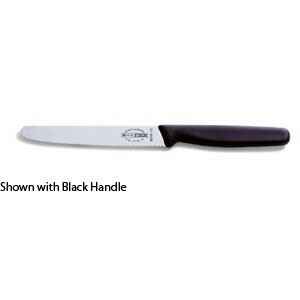 This handle also provides comfort and protection against hand strain and fatigue.